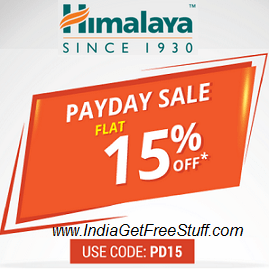 Himalaya is offering Flat 15% discount on products at its store. Just follow the steps provided below to redeem Himalaya Store Payday Sale Offer. Add the products in the cart you want to buy. Make payment from suitable mode. Offer subject to availability of stocks. Offer valid only with the use of code: PD15. Payday Sale is valid till 01 October 2018. Offer not applicable on Combo/Saver Packs. Free shipping on orders over ₹399/-. COD orders can be delivered only at serviceable pin codes. Offer valid only on purchases from Himalayastore.com and the official Himalaya store android app.